One of the ‘bellflowers’ Campanula persicifolia is a clump forming summer flowering perennial with white to blue flowers depending on cultivar. The tall flower spikes make this an excellent plant for cut flowers. The species is commonly called the ‘Peach Leafed Bellflower’, it is easy to grow and one of the most popular of all of the bellflowers. This is the one with the lavender blue flowers. 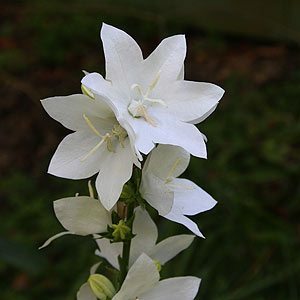 The white variety is Campanula persicifolia grandiflora ‘alba’ and for us this is a very strong growing variety that flowers reliably every year with very little care or attention. In our garden the plants are evergreen with a good foliage cover year round. They are slow spreading and an excellent ground cover. The flower spike will reach to around 1m in good conditions and the white flowering variety we grow attracts attention from bees and insects alike. Look for ‘Chettle Charm’ beautiful white flowers tinged with blue. Evergreen to semi evergreen depending on conditions Campanula persicifolia prefers a humus rich moist soil, try digging in some coco peat (coir peat) or well rotted compost. Campanula persicifolia grows well in full sun to part shade, although protection from hot afternoon sun is an advantage. Position – Full sun to afternoon shade. We grow ours in light afternoon shade. Warer requirements – We rarely water our plants, however in dry summer, some additional water will be beneficial. Fertiliser – We use a pelleted fertiliser in early spring (Seamungus). Campanula persicifolia varieties are available for sale from the following participating nurseries.